Have you ever avoided creating a Facebook Live, a Zoom presentation, or webinar – simply because you didn’t know how to start? Has the thought of “going live” ever caused you to feel stuck in place, paralyzed, like a deer in the headlights? So you wind up not doing anything? Hey, I’ve been there – Done that! When I first started to grow my business online, I finally realized something. That one big obstacle to my success was worrying – even obsessing about – exactly how to start. I’ve got some great news for you. You don’t have to stay stuck! So you won’t have to worry about yourself and can focus 100% on your prospects. When you’re conducting meetings or presentations at Starbucks, at a hotel, or in someone’s home, you have your prospect’s undivided attention. When somebody’s sitting in the room with you, it’s hard for them to sit there and check their phone, get up to order more food, or leave for a few minutes. When it comes to conducting a meeting or event online, you only get one chance – about 30 seconds – to get and keep somebody’s attention before they get distracted and move on. 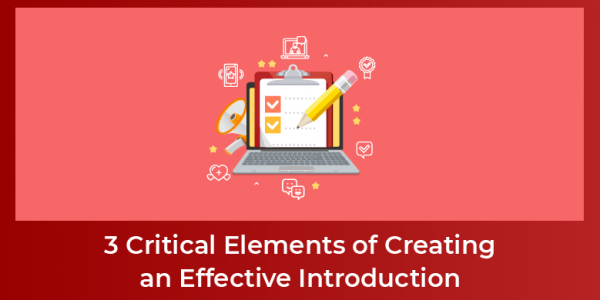 That’s why it’s critical to create a powerful introduction for anything you’re doing online. As you’re reading this, what else is going on in your life right now? There might be music or the radio playing in the background, kids running around, incoming email or message alerts, and open windows or websites on your monitor. So given that’s all going on in your life, what do you imagine is going on in your audience’s life? You have to break through the noise of distraction, get their attention, and get them to engage with you immediately. Because in their minds, they’re thinking – what’s in it for me? Instead, make your introduction all about your audience. That’s the first step to getting anyone’s attention. If you’re worried that you have no credibility or authority because you lack results, I literally just gave you a way to avoid worrying about that. Because it’s not about you. It’s about your audience. Once you share what’s in it for them to pay attention, start engaging their emotions. Here’s what I know: when people get online for a webinar or Facebook Live or any other presentation, they’re distracted. They think they can multitask – that they can watch a Facebook Live, supervise the kids, and do the dishes at the same time all at 100% efficiency. So after you let your audience know what’s in it for them, pierce the noise by engaging their feelings. A. How would you feel if …? How would you feel if you could effortlessly put on your jeans without lying down, and zip up your fly without your stomach hanging over? Or, how would it feel not to have to worry about how your clothes fit anymore? How would that feel for you? B. What would it feel like if? What would it feel like if you could chase and play and run around with your kids all day without losing your breath? Holy cow, what would that feel like? What if you could have all of those things and you didn’t have to radically change your diet or work out 3 hours a day? Then invite your audience to respond. “Feeling” questions like these help people want to hang out with you. C. What would that be worth to you? This question is really powerful. You’ve just invited them to engage, to imagine themselves out of their current situation, and to start thinking into the future about what they want. When you ask, “What would that be worth to you?” you are now having a sales conversation. They’re giving you a price tag. You’ve guided your prospect into that space of – that would be life changing for me. The first step is to remind yourself it’s not about you and share what you’re going to be talking about that will interest them. When I first started, I thought I had to share all the amazing things that happened in my life, which frankly, when I first started out, weren’t happening. I wasn’t a top earner. I wasn’t a huge producer. Worse yet, I hadn’t recruited a bunch of people in a short amount of time. In fact, every day people messaged me to stop sharing my business opportunity links on their page. So that’s exactly what you need to realize in order to tell your story. It’s a story of struggle. Talk about when you hit rock bottom, and what you discovered. What you discovered is what you’re going to talk about in your presentation. For example, I introduce myself as a former second grade teacher. I posted my business opportunity links in all my groups, all over other people’s fan pages, and all over my own personal timeline. I was not getting results. My “rock bottom,” was a conversation I had with my husband after working the business for six months. He saw me struggling, crying every day. I was not happy. I was doing everything wrong and I wasn’t seeing any light at the end of the tunnel. Started working from there, and started creating real, positive results. Telling your story of struggle means revealing the ineffective, stupid things that you’ve done that didn’t get you any results. Admitting the struggle creates authenticity. It creates vulnerability. It makes you relatable and real. They don’t want to know how many trophies you’ve received, how much money you’ve made, or how many awards you have. Very often when I share my story of struggle, I have to laugh. I’m okay with that because my job is to be a messenger of information, not to toot my own horn. The next step is to start talking about what I call results. I’m going to ask you to think differently about what that word means. Have ever reached out to a prospect and had them respond back? Have you ever recruited anyone into your network marketing business, whether they’re from your cold market, your warm market, or your friends or family? Do you believe that what you’re doing in your business is going to help you take the vacation you’ve always wanted, take care of your family the way you’ve always wanted, or create the kind of significance in your life that you’ve always wanted? Your business is a vehicle to help you do the things you want to do in your life. You have had results – even if you’re not where you ultimately want to be. You have results that someone else wants to know about. Or embarrassing things you did when you first started out. Then talk about the results you DO have! Your results do not have to be as big and badass as people say. Share your small victories that are leading you toward a bigger future for yourself. Those are results that people want. The point is, even if you’re not where you ultimately would like to be, you’re on your way. First, share what your audience is going to get from the training/presentation/event. How would it feel if you had …? What would it feel like to …? If you had those things what would that be worth to you? Third, share your story and your results. Because you are already much more powerful than you even realize. Once you hone this process and practice, your introduction only needs to take a few minutes. Yet it will prove to be very powerful as part of any presentation, live event, or training you’re doing. It’s a great way to get people engaged. Until you take action, NOTHING is going to happen! That’s why working with Elite Marketing Pro is so powerful. They help you get into action, get resourceful, and start actively sharing what you have to offer. After all, you’re not just growing yourself. You’re helping others to grow. Then I strongly recommend getting access to my FREE 10-Day Online Recruiting Bootcamp to discover how to build your business using attraction marketing. You’ll learn all about about the specific tools and techniques we use to connect with prospects online, so you’ll never have to act desperate, chase down or strong-arm prospects, or deal with cold calling and rejection, ever again. The bottom line is that, in today’s age, you don’t need to be pushy, obnoxious, or overly-aggressive to build a successful business! Click here to access EMP’s 10-Day Online Recruiting Bootcamp today!